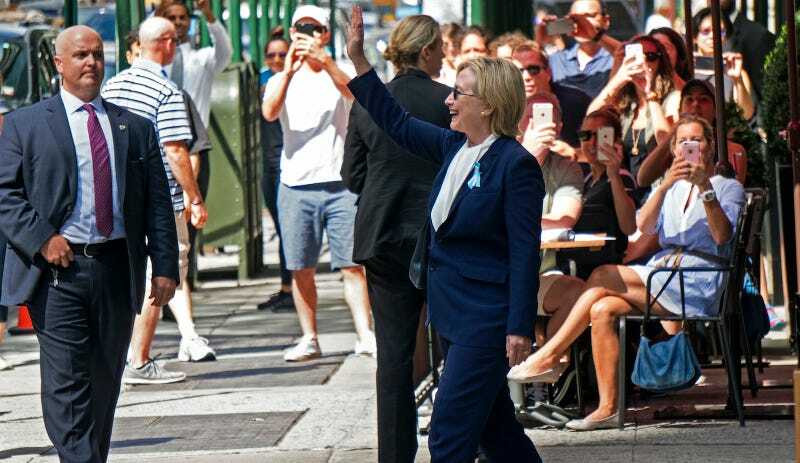 Hillary Clinton greets onlookers outside her daughter’s apartment building after becoming unwell at Sunday’s 9/11 anniversary ceremony. Image via Associated Press. As the country whips itself up into an embarrassing frenzy over Hillary Clinton’s pneumonia diagnosis, Trump fans, emboldened by the exciting prospect of an actual illness, have treated themselves to a brand new conspiracy theory: The woman who exited Chelsea Clinton’s apartment on Sunday, feeling “great” after appearing to collapse at the 9/11 anniversary ceremony, was actually a body double. Sure, why not? The Clinton campaign, after facing criticism over concealing the pneumonia diagnosis—why ever would they want to do that?—has promised to release more medical information about the candidate this week. Her opponent, who has been far less transparent about his own health, has committed to appear on an episode of Dr. Oz’s daytime show—a match made in heaven, really—to “reveal his own personal health regimen” and release “very specific” medical records. Anyway, I’m going to go ahead and sprint towards the Alaskan wilderness so I can live out my days sharpening a large stick in a frozen mud hut by myself, if anyone would like to join me!